Share your views, leave a comment! Is this not the same chart repeated three times and in fact the titles are not correct. Impact on Customer Numbers is quite right, but impact on Competition…. How is that measured? In what unit? And Impact on Consumers? Really? Would be interesting to track the cost per talking minute as the impact on consumers, that is the real impact. The fact is the number of handsets has increased as is covered by the three charts but IM not sure what the purpose of these charts is? 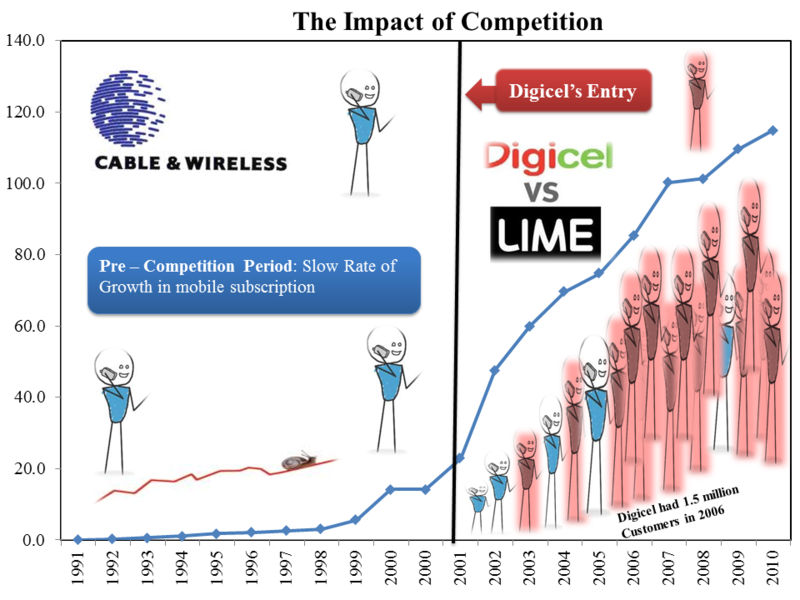 Does it prove that Digicel or LIME has helped competition… no. 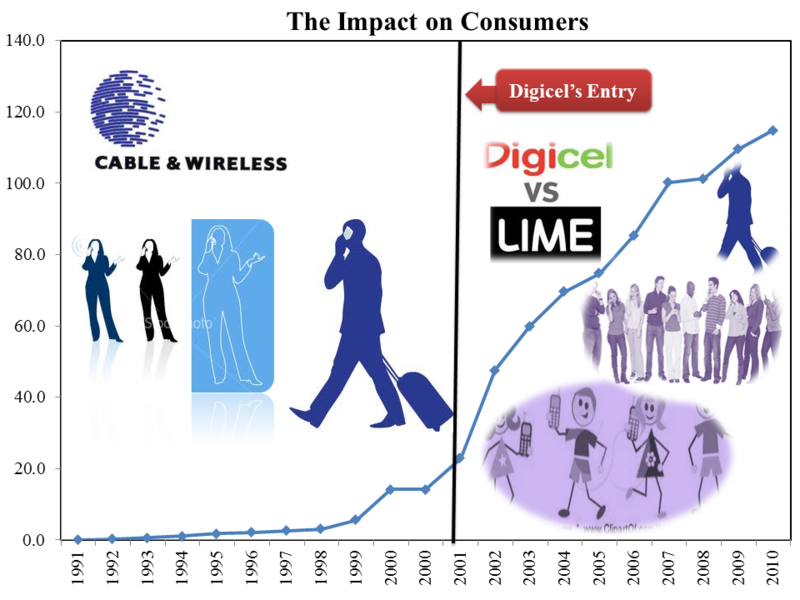 Does it show that Digicel or LIME has helped the customer…No. Does it show the number of mobiles has gone up…. Yes. So what?! As useful as a chart showing the number of leaves on a tree. Thanks much for such constructive criticism, your candor is admirable. Firstly, the general construct of all three charts are the same. The images within these charts differ however; the first gives a general plot of the subscription rate pre and post monopoly. In addition to the plot of subscription, the second chart highlights the impact ‘of’ competition! “Not the impact ‘on’ competition”! That is, competition has allowed more people access to mobile phones – as you rightly stated. The differences in the number of ‘stick-men’ between the two periods illustrate this. Even the colours of the stick-men vary – blue and black (Lime) and Red (Digicel). Therefore, the impact ‘of’ competition is highlighted by the exponential growth in mobile users. I do agree that the cost per talking minute would provide additional information, but if it were the case that cost per talking minute was higher with the introduction of competition then why would the number of customers increase? The third chart went on to show the types of people using mobile phones pre vs post monopoly. Yes, children are now seen rampant with mobiles in the post monopoly period. Was this the case before? So again, more people are able to enjoy the utility of a mobile phone since competition has entered the market. We consider this a benefit to consumers! Thanks for the reply. Im still a little confused as to what all three charts show us about the impact “of” competition. Maybe it would be good to see the global trend overlayed on this so we could see if it really was competition that caused this or whether it was simply a global trend anyway. Still failing to see what the charts say other than the number of phones has gone up. Is that as a result “of” competition……. who knows because the charts are only telling part of the story. I like the theory, just think its a little bias to one school of thought…. 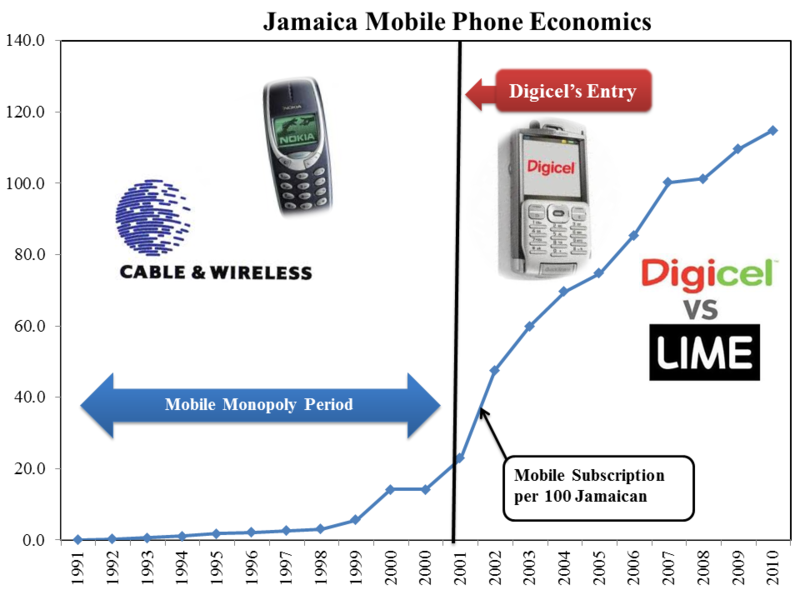 that thought is that Digicel is responsible for opening up competition. That is debateable and this analysis just tells us that the number of handsets has gone up. Still failing to see how the second chart is different from the first (and of the third for that matter) but I’ll let it pass. Thanks for that suggestion, we will do a follow up to improve the analysis as you rightly pointed out. So look out for it!